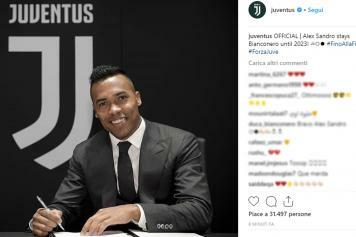 Premier League giants Manchester United and French giants Paris Saint-Germain have been dealt a blow in their chase of Alex Sandro, as the Brazilian has signed a new deal at Juventus. The bianconeri confirmed that the left-back has put pen to paper on a new deal, after weeks of speculation about whether he will extend his stay at the Old Lady or not. The new deal sees Alex Sandro commit himself to the club till the summer of 2023 and he has earned himself an increase in the salary as he will now earn about 5 million euros plus bonuses in the new deal. The statement on the official Juventus website said: "The fans can be sure of having a player who will always give 100% to get the win. ", there were the words spoken by Alex Sandro in 2015 when he was presented as a Bianconeri player. Never could a truer word be said about the Brazilian, who today has pledged to continue that will by committing himself to Juventus until 2023." Manchester United had drawn links with a move for the left-back, but PSG had made two offers to sign the Brazilian this past summer, but Juve had pegged both of them back, asking for a higher fee.